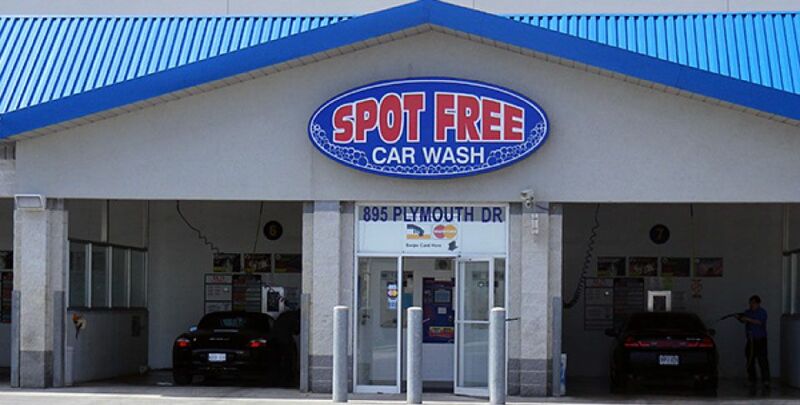 Spot Free Car Wash in Mississauga offers coin-operated and self-service car wash bays with all the amenities you need to keep your vehicle sparkling. Our car washes offer several extras to help clean your car’s body, tires and engine, including high-quality soaps and waxes and spotless rinses. Spot Free Car Wash offers round-the-clock services throughout the entire year. Our state-of-the-art facilities offer nine different functions from which to choose. We provide high pressure soap and rinse, as well as clear coat and carnauba wax. Additionally, we offer low pressure engine and tire cleaning. Our reliable car wash services start at just $4.00. For those times when your dog is as dirty as your car or perhaps covered in skunk spray, our Streetsville and Milton Spot Free Car Wash locations offer self-serve dog washing stations and blow dryers. A short ramp to the station easily brings your pet to your level, eliminates bending over, and makes your pet accessible from several sides. Our open, bright bays are the perfect place to check your pet for fleas and ticks, too. Our dog washing stations and blow dryers come with all the instructions you’ll need, and prices start at just $5.00. Basic Wash or Ultra Wash? Check out our washes and options!